Get a report on any Key Performance Indicator (KPI) that you require. With INTUNE+ software, you can finally complete your process control predictive maintenance program by going beyond the device level. Differentiate between hardware and tuning problems with functional, flexible, and customizable tools that truly put you in control. To complement its standard statistics feature, INTUNE+ software also provides a diagnostic scripting tool for the creation of user-defined metrics and KPI’s. This flexible scripting tool allows you to turn raw data and statistics into useful metrics that managers can use to optimize their process control. This sample script includes custom functions for calculating process waste, energy cost, loop tuning quality, and assessment indices for the specific process. Each script gives the user complete freedom in its development and design, using up to ten input addresses from any INTUNE+, I/O, or user-defined tag. Script outputs can be floats, integers, Boolean values, strings, or bitmap images that are easily incorporated into INTUNE+’s customizable, web-based reports or can be used elsewhere as special event triggers, reset or fault bits, or alarms. With so much flexibility in their creation and design, the INTUNE+ custom performance measures are a tremendous support to any process control predictive maintenance scheme. INTUNE+ software includes over 80 standard process measures with real-time moving window analysis and condition-based assessment. Much more than just a number cruncher that pulls data from a historical file, the INTUNE+ performance indices feature allows you to start and stop calculations based on shifts or batches, reset error calculations based on operator mode changes, or trigger entire sets of calculations based on alarm states—all in real time. The conditioning triggers can be based on any INTUNE or I/O tag addresses that can be read via INTUNE+ software’s OPC client. The real-time analysis uses moving windows customizable to user-specified length (seconds, minutes, hours, days, weeks, or months), ensuring the calculations use the most up-to-date information. And, since INTUNE+ software also acts as its own OPC server, it’s no problem to connect other OPC clients to INTUNE+ software’s rich assortment of assessment indices. With INTUNE+ soft ware, you get intelligent process assessment that is customized to your specific needs for each and every process loop. Once critical performance info is calculated, INTUNE+ provides a variety of ways to visualize and understand these metrics. One way that INTUNE+ makes metrics visible and understandable is by trending them over time with the KPI Trending feature. Now plant personnel can track higher level unit and process performance information in real time as easily as they track process variables in the HMI or historian. This trending module is a powerful analysis tool for any tech, engineer, or manager; it provides a user-friendly alternative to performing hours of side-by-side report comparisons. Here’s a look at the KPI Trending module in action. Its adjustable scaling and color-coded labels for all trends make identifying and tracking key performance areas an easy task. The customizable capabilities of the Event Server tool provide users a crucial element in process control predictive maintenance. Notify operators, engineers, maintenance personnel, shift managers, and/or plant managers via email the instant an alarm is reached or another user-defined event occurs. Automatically record the event to your system’s event log while notifying the appropriate employees. Each event is user-specified, and the initiating address can be read from any INTUNE or I/O tag. Sample configuration dialog for the Event Server. The Event Server realizes its greatest potential when used as part of a predictive maintenance scheme that includes notifying appropriate personnel before alarm levels are reached, when loop quality becomes less than acceptable, or when the costs of energy or raw material waste exceed certain pre-defined limits. Customize the event notification so that the right personnel (maintenance, operators, engineers, or managers) get the right notifications without receiving extra clutter. Customized reports can also be generated and sent along with the email notification. As with the Diagnostic Script tool, the Event Server lets you fully customize your INTUNE+ software to truly put you in control of your process. To help correct loop quality problems, INTUNE+ software includes INTUNE PID Tuning Tools with auto tuning, heuristic-based adaptive tuning, offline data tuning, and offline model-based tuning. Also included is a PID comparison tool, along with a variety of online and offline process and PID simulation features. For more details on these powerful problem correction tools, see INTUNE PID Tuning Tools. Requires no additional hardware or instrumentation; uses information available in existing control systems, specifically process values, controller outputs, setpoints, and valve position (if available). Can perform analysis with or without valve position feedback signal. Analyzes the performance of valves in normal closed loop operation, and reports status in real time — no need for intrusive testing methods (online mode). Measures and detects in real time the gradual degradation of loop performance due to valve problems, aiding in predictive maintenance (online mode). Performs a similar analysis on data collected by any historian (offline mode). Enables users to visually evaluate the trend and data plot provided by the diagnostics tool through the Results display. Uses pattern recognition technology to provide both qualitative and quantitative stiction diagnostic results. These results are complemented by a measure that indicates confidence of the analysis with time stamp. Lets users save and report on valve status parameters and trends. Users can also plot data from current online diagnostic, offline diagnostic, or maximum stiction results. Configure diagnostics using a wizard tool or by entering the specifications line by line (advanced). About 30%* of unacceptable control loop performance in process industries is due to problems with control valves. Variability caused by control valves is difficult to regulate without proper diagnosis and treatment of the source. When valve position is not available for analysis, the faceplate of the Valve Diagnostic tool for Closed Loop Monitoring shows CO-PV plot and Stiction Index (a confidence level). This faceplate combines an Ygraph of the controller CO-PV with control loop time-trended performance data. The severity of stiction is quantified as a percent value. This display also provides a qualitative determination, confidence level index, and the daily worse-case stiction data. The Valve Diagnostics plugin saves the maximum stiction measurement, and allows users to reset the measurement when desired. 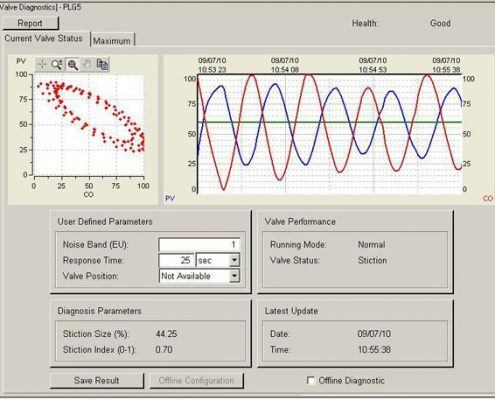 When valve position is available for analysis, the faceplate of the Valve Diagnostic tool for Closed Loop Monitoring shows MV-PV plot and valve position in Trends window.> When the valve position is available to use in the analysis, a more accurate valve performance determination can be made. Having the valve position signal (MV), the CO-PV graph changes to CO-MV and valve position is also shown in Trends window. This sample web report shows control valve performance for multiple loops in a quantitative and qualitative format. This report can be used to monitor valve performance over time or to establish a baseline for evaluating subsequent improvements. One of the important features of INTUNE+ software is its ability to generate web reports from the results of the diagnostic tool. 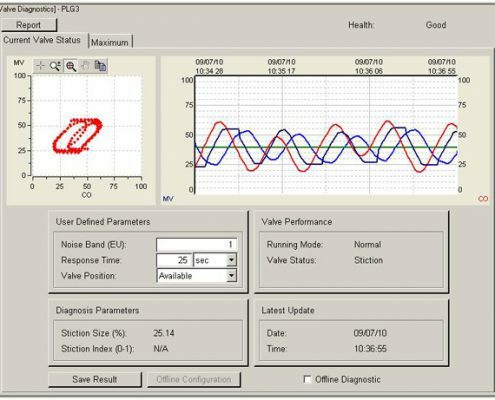 This report uses the outputs of the Valve Diagnostic tool for a number of loops. * Srinivas Karra and M. Nazmul Karim in “Oscillatory Control Loops: The Lost Economic Benefits. Can Anything Be Done?” (Process Control & Optimization, 2009 AIChE Spring Meeting). Get customizable dashboards that provide the information you need, when you need it—for corporate engineers, plant managers, or maintenance teams. 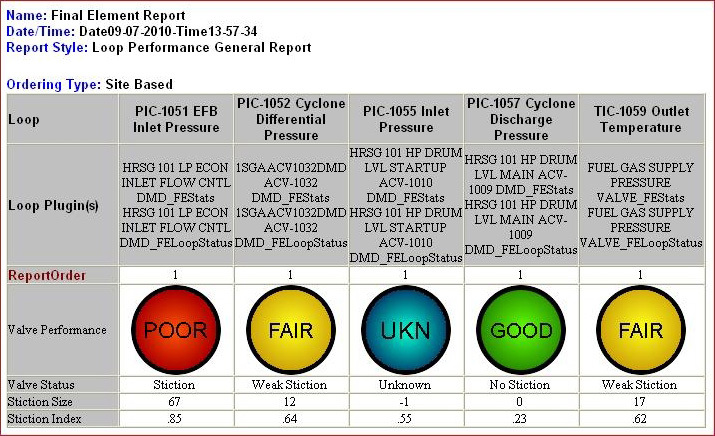 Automatically generate reports that indicate poorly performing loops for maintenance personnel. Create in-depth statistical analysis reports for engineers who want to know the gritty details for all loop operations. Generate bottom-line reports for managers that, in a few key indices, indicate which loops or areas are operating efficiently, which are not, and the real cost financial impact on the plant. Dashboards can be used to visually indicate tuning quality or plant performance, saving busy managers and operators from the hassle of decoding obscure numbers and sorting through statistics. INTUNE+ software also has a web report server, which allows managers access to all reports generated for a plant or corporation, with the ability to sort reports by date and time, category, or keyword. These dashboards can be created manually or with INSIGHTTM Display Builder, included with INTUNE+ Software. Using INSIGHT Display Builder, you can create customized HMIs via a drag and drop interface, making modifications as needed for your plant. Use INSIGHT Display Builder to create web-based displays for at-a-glance plant health 24/7. INTUNE+ software connects to most I/O devices and their associated controllers using OPC technology. The OPC client allows easy access to any control system through the controller OPC server. For the more commonly used controllers, INTUNE+ software automatically maps the parameters of the selected controller to the INTUNE controller object. INTUNE+ software maintains real-time connections with your process PID loops, and updates all process parameters at every sampling interval specified. INTUNE+ software is also its own OPC Server, so other clients have access to INTUNE software’s unique performance calculations and measures. INTUNE+ software interfaces with the OSIsoft PI System® to leverage valuable historical and real-time data that can be used to optimize plant performance. Analyzing this data, INTUNE+ software can make adjustments to process variables that will help your process run in a stable, predictable, and consistent manner, at or close to setpoint. * Server quality processor preferred. Important: .NET Framework version 4.0 must be installed on the PC. .NET 4.0 is included in the installation routine and will be automatically detected or installed if it does not exist on the PC. Multiple versions of .NET can coexist on the same PC.